I wrecked about 3 weeks ago, almost totaled it. Finally got it back together with some new parts added. And here’s a list of everything good on the bike. 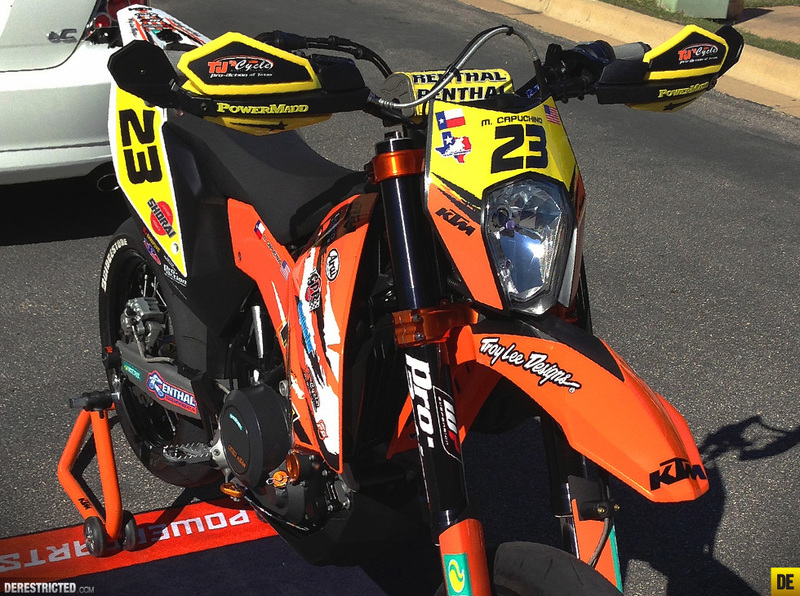 – KTM Saxess Tubless Wheels. 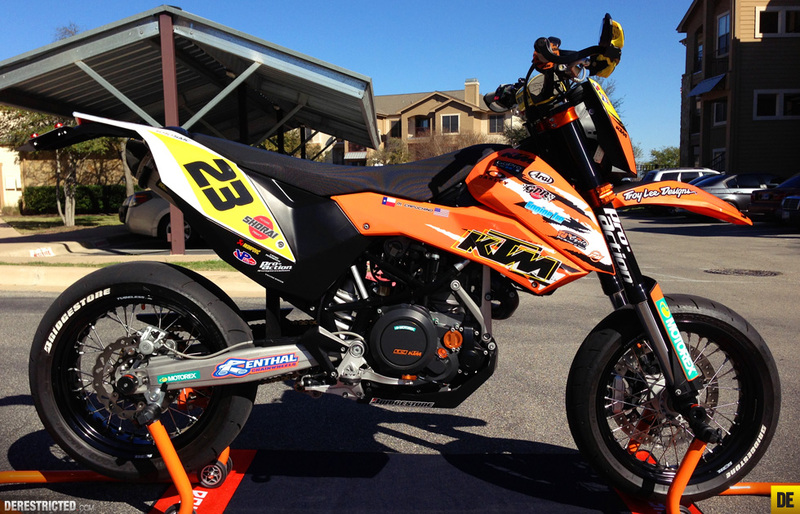 – KTM Powerparts Front And Rear Axle Sliders. – WP Pro-Action Front And Rear Suspension. – PIAA Ultra White H4 Headlight Bulb. 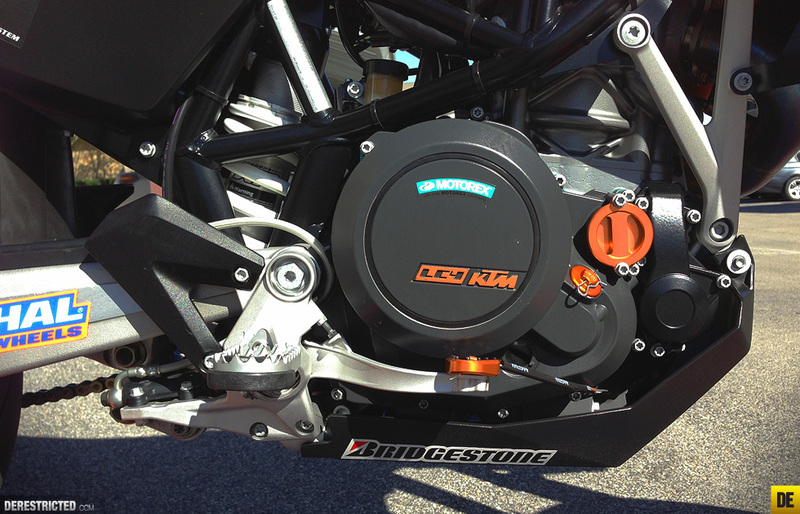 – KTM Powerparts CNC Machined Orange Triple Clamps. – Pro-Bolt Titanium Bolts For Triple Clamps. – Motion Pro Fork Bleeders. – Renthal Fatbar 672 Bend Handlebars. – Renthal Fatbar Bar Par With Custom Installed DRC Lap Timer. – Renthal Oversized .32 Grips. 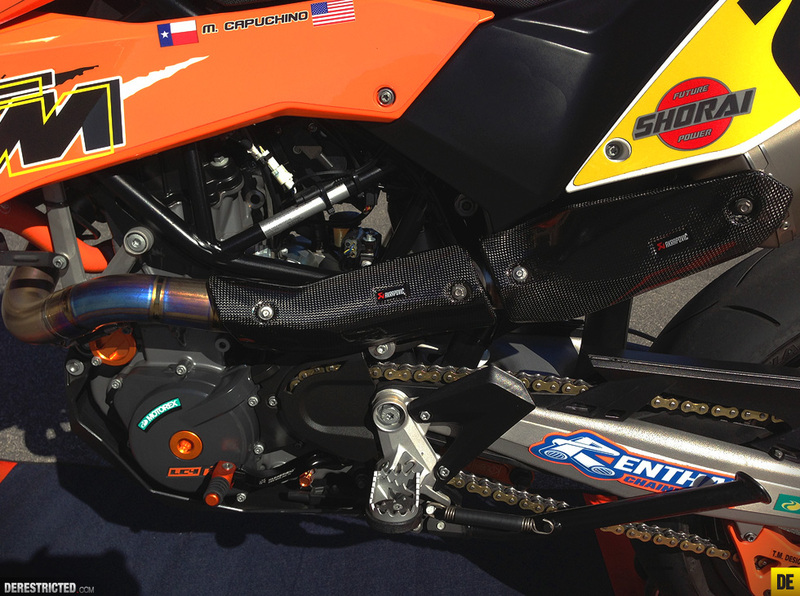 – Powermadd Hand Guards And Mirrors. 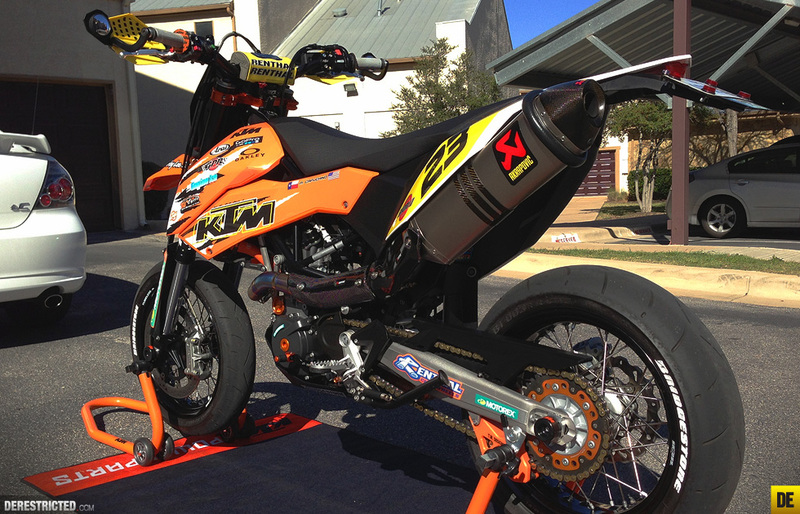 – KTM Evo 1 Power-Up Kit. – Shorai 1lbs Lithium Ion Battery. – Full Akrapovic Titanium Exhaust System With Akrapovic Caron Fiber Heat Shields. – Hammerhead Shifter And Shifter Bolt. – Renthal Road Racing 520 Chain. – Samco Orange Silicon Radiator Hoses. – T.M. Designworks Chain Guide. – KTM Supersprox Stealth Rear Sprocket. 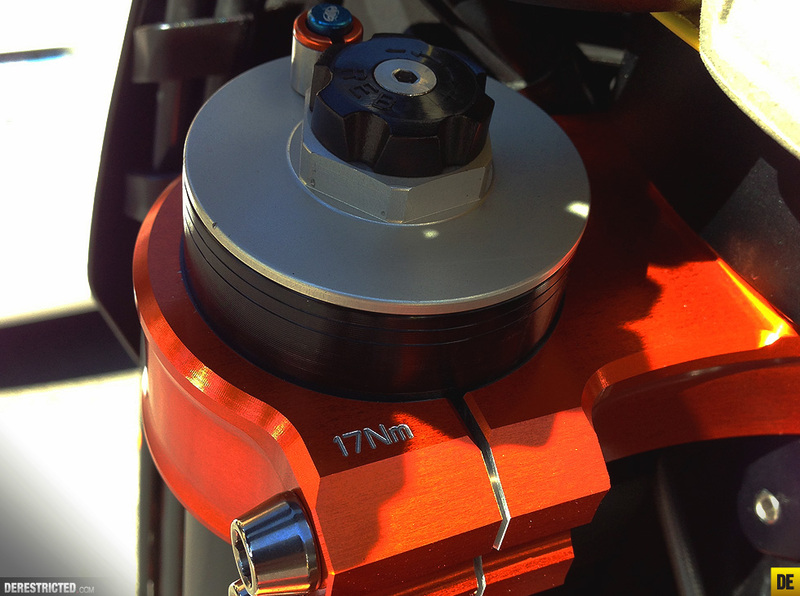 – Brembo Front Rotor, Front And Read Calipers. – Galfer Rear Floating Waved Rotor. – Kouba Link -1 Inch. – STR Orange Rear Brake Lever Tip. – KTM Powerparts Orange Valve Caps, Oil Filter Caps, Oil Filler Cap And Ignition Cap. – And Much More To Come!!! hi maty nice 690, could u tell me pls where did u get the gerar shifter ( and what part nr ) and also the orange chain slaider. SO SO SO SO FOOOGIN SWEEET! Kronreif und Trunkenpolz Mattighofen forever! That is one nice bike, looking for one myself. Michael I am building your soon to be Nemesis!